Friends.. 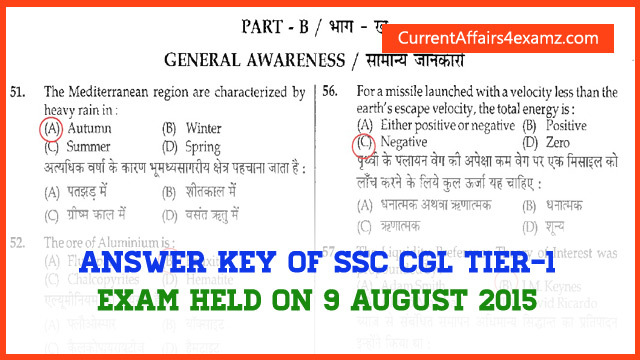 Here is the Complete Answer Key of SSC CGL Tier-1 held on 9 August 2015 in Morning and Evening Shift. Morning Shift had the question code RK-2015 and evening shift had the question code KS-2015. 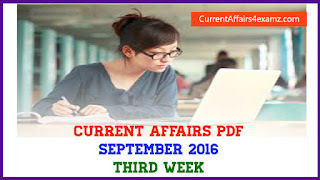 Last day we have provided you with the Question Paper PDF of both Shits. Hope you all have downloaded that. We have also updated the solved part of GK. Now we bring you the Complete Answer Key of SSC CGL Tier-1 2015 of both morning and evening shift. Remember this is the unofficial answer key prepared by a private coaching institute. Official Answer Key will be soon be published by SSC and we will update that. For that reason the answer key may not be 100% accurate. So give a 5% tolerance level for this answer key. Update - 8:57pm, 11 August: Due to heavy traffic, some of our visitors faced some issues with downloading. So, we have removed the download link and now on, we will be sending the PDFs directly to your email IDs as requested by most of our visitors. (If you are using mobile and unable to see correct answers marked..please use desktop for better experience). Enter your name and email and you will receive the PDF on your email within 5 minutes. If you don't receive it within 5 minutes, please check your 'spam' folder too.